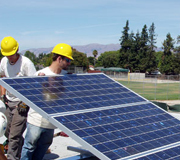 Green Energy EPC is a San Diego, California based solar energy Engineering, Procurement and Construction (EPC) company with operations in southern California. We design and install Solar Electric (photovoltaic, PV) which provide measurable and meaningful benefits to our customers, our country and our environment. We enable our residential, commercial, agricultural and non-profit customers to generate their own clean green electricity safely, reliably, and with an attractive return on investments. We design and install superior quality, cost effective solar electric and solar hot water systems. Are you interested in going Green? We believe in the Green revolution! Let's harness the Sun light to generate electrical energy. Eliminate ever increasing Utility electric costs while protecting the environment. Simple and thoughtful designs make financial sense. Interested in working with us? Call or email us. LET’S GO GREEN - Please Read More! Let's chat or send us an email! Copyright © 2012 Green Energy EPC. All rights reserved.